This comprehensive course covers key tax issues for completing complicated individual returns. All topics include coverage of new legislation, revenue rulings and procedures as well as new case law to help the busy practitioner stay current. Speakers are all practicing preparers who share effective tips and insights to help you get ready for this tax season. Some of the hot topics we cover include changes to health care law, resolving ID theft problems, reporting in the sharing economy and adjusting for compensation-based covered securities. All new law, once passed, will be covered. Register by September 1st and Save! Refunds and Cancellations: Requests for refunds must be received in writing by October 15, 2017 and will be subject to a $75 cancellation fee. No refunds will be granted after October 15, 2017. For more information regarding refund, complaint and/or program cancellation policies, please contact our offices at (800) 966-6679. Attendees receive a comprehensive manual that alone is worth the price of registration! *Reserve your room by October 24, 2017 to receive the group rate. 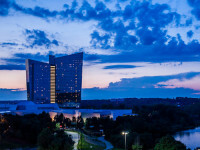 Mohegan Sun, created in 1996 by the Mohegan Tribe of Connecticut, is one of the world’s most amazing destinations with some of New England’s finest dining, hotel accommodations, retail shopping, live entertainment and sporting events. Amenities include: three world-class casinos, a 10,000 square foot pool, a luxurious day spa, and a state-of-the-art Poker Room. Make a vacation of it!